Corruption at Durban Harbour – the plot thickens « What Happened to the Portcullis? With reference to an earlier post “Trade costs and corruption in Ports of Durban and Maputo” (March 2012) the following article ‘Hawks probe Khulubuse Zuma’s pal’ published by the Daily News (Durban) suggests more sinister individuals involved in the scam which saw a policeman being gunned down at his home and no less than 10 SARS officials placed on suspension. A web of intrigue indeed. A wealthy South Africa-based Taiwanese businessman and former business associate of Khulubuse Zuma, a nephew of President Zuma, is being probed for alleged links to a multibillion-rand racket at Durban Harbour. In June the Hawks in KwaZulu-Natal secured a warrant of arrest for Jen Chih “Robert” Huang, CEO of Johannesburg-based company, Mpisi 74, when investigators from the elite unit also raided Huang’s business in Bedfordview, and his home. Huang, a convicted murderer, was in Hong Kong on business when the warrant was issued, and it has not been executed after he side-stepped the Hawks by directly approaching the National Prosecuting Authority (NPA) to make representations as to why he should not be arrested. The businessman, part of a delegation that accompanied President Zuma on a state visit to China in 2010, is wanted on multiple counts of alleged corruption. According to Daily News, Huang denied having any links to alleged illegal activity at the harbour, and referred all queries to his attorney. “I have been out of the country. “Speak to my attorney in Durban. He is handling all matters related to my company.” His attorney, Quintus van der Merwe, confirmed representations had been made to the State, but declined to comment further. The warrant for Huang’s arrest came weeks after a former South African Revenue Service (Sars) anti-corruption task team member, Etienne Kellerman, was arrested on 80 counts of alleged corruption. Kellerman, 42, is suspected of receiving substantial benefits for allegedly allowing contraband through the harbour. The Daily News broke the story when Kellerman was arrested in April this year after a three-year covert investigation. An international syndicate that was allegedly bribing customs and police officials to allow in container-loads of contraband, was also exposed by the Hawks. Sars spokesman, Adrian Lackay, told the Daily News that following the joint investigation with police over several months into the existence of a criminal syndicate operating at Durban Harbour, 10 Sars employees had been suspended. “Their suspensions follow the arrests of other suspects outside of Sars. These employees were suspended over a three-week period following the arrest of Kellerman on charges related to fraud, theft and misconduct,” he said. “The 10 employees remain suspended pending the outcome of an internal investigation into alleged involvement with clearing agents.” Over the past two years, during this investigation, police seized more than R1 billion worth of counterfeit goods and contraband. The alleged corrupt Sars and police officials are believed to be working in teams between KZN and Gauteng. They are allegedly paid bribes of up to R30 000 for each container allowed to pass through customs undetected. Big name international companies, mainly from China, are also being investigated. Kellerman has pleaded not guilty and is on R100 000 bail. According to its website – before it was removed – Mpisi 74 is a massive concern, offering a range of services, including import, export, forwarding, warehousing, cellphone telecommunication and machinery, as well as vehicle manufacturing. Just days after Huang was contacted by the Daily News, the website was taken down.It had even boasted pictures of the president’s nephew, Khulubuse Zuma, with the Taiwanese businessman at the company’s headquarters in Bedfordview, on December 9, 2009. 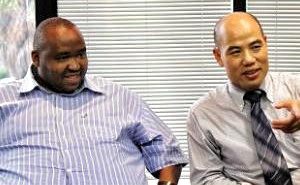 The Mail and Guardian, in January, described Huang as the influential middleman in deals between Chinese companies and Khulubuse Zuma. It said Huang was also instrumental in introducing Chinese vehicle manufacturer, Dong Feng Motor Corp, to Khulubuse Zuma, who at one point was the “chairman” of Mpisi.The report said that in 2010, Dong Feng announced a joint venture with Khulubuse Zuma and Huang to distribute its products in South Africa and the rest of the continent.In 1998, Huang was convicted of the murder of a Taiwanese businessman, Ching-Ho Kao, who was found shot dead in March 1996, in the Free State. His body was set alight. The trial began in the Bloemfontein High Court in November 1997. The indictment claimed the motive for the murder was that Kao’s family owed Huang money. Huang was sentenced to an effective 12 years in prison. But, through remission of sentence, he was released in 2003 and set up Mpisi 74. This is an interesting post to put it mildly. Not all of it new to myself, but it is interesting when viewed in conjunction with other reports involving high profile and/or well connected persons/businesses. I do hope you have made suitable arrangements for your personal security. I am a teacher at a rural town at KZN. At the time this article was published by the daily news the staff of Mpisi were busy distributing a truck loads of much needed clothing and blankets to the children of our community. I did not see any reporter reporting on the good work done. If only all companies in South africa did the same amount of good work. In my limited dealings with Mpisi they have always been a kind and compassionate group of people. I have checked their website and it is running perfectly, I cannot but wonder what other “facts” the reporter is fabricating. I also see no fault in someone who has a very bad past but is trying his best to make amends . I also wonder what is so bad about introducing foreign investment in South Africa, creating jobs and skills for South Africans.